The training week is over now and we have started to settle into our project sites. Its a good time to look back and share impressions of the first week of our Summer of HPC! This year, the training week took place in the lovely city of Barcelona. Most of us arrived there on Sunday, including me. About 30 degrees and lots of sunshine – lovely weather for a beach trip! Not so lovely for dragging almost 30 kg of luggage uphill though, especially while constantly worrying that you’ve misunderstood the map and gone in the wrong direction! Luckily, that didn’t happen. After a night of well deserved sleep, we met in the lobby of our hotel to discuss breakfast plans and meet the other students, which was followed by a walk in the gardens surrounding the Palau Reial de Pedralbes. For the first two days, the most frequent questions were probably “So, what’s your name? Where are you from? Where will you go next week? Which project will you work on?” but soon, a sense of familiarity began to settle in. Having a shared interest in high-performance computing (HPC), as well as, the many hours spent together in one lecture room, definitely made it easier to connect with each other! The training week officially started on Monday at 11 am with a welcoming coffee in the foyer of the gorgeous Torre Girona – home of BSC’s supercomputer MareNostrum. Equipped with new notepads, a pen, our BSC badges, and a USB drive with all the lecture slides, we moved on to the Sala Gran where all our lectures took place. 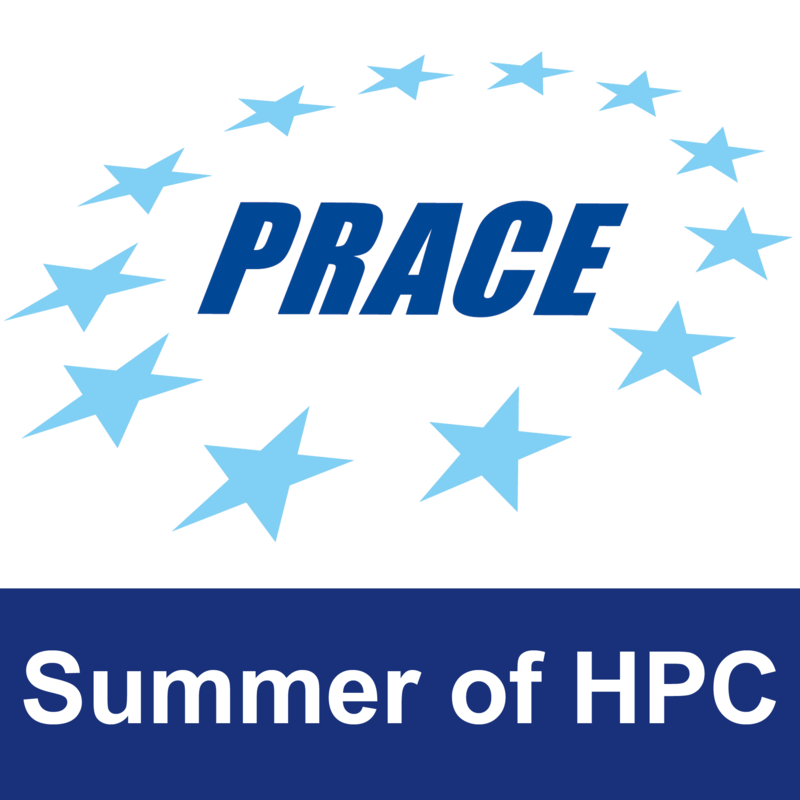 We started off slowly – introducing ourselves, discussing the agenda for the upcoming week, talking about PRACE’s goals, outreach, and our role as HPC ambassadors. Since the opportunities for just having a spontaneous chat were a little limited during the lectures, we opted for a joint evening activity. And what better to get to know each other than to share a drink? So, off to the pub we went! 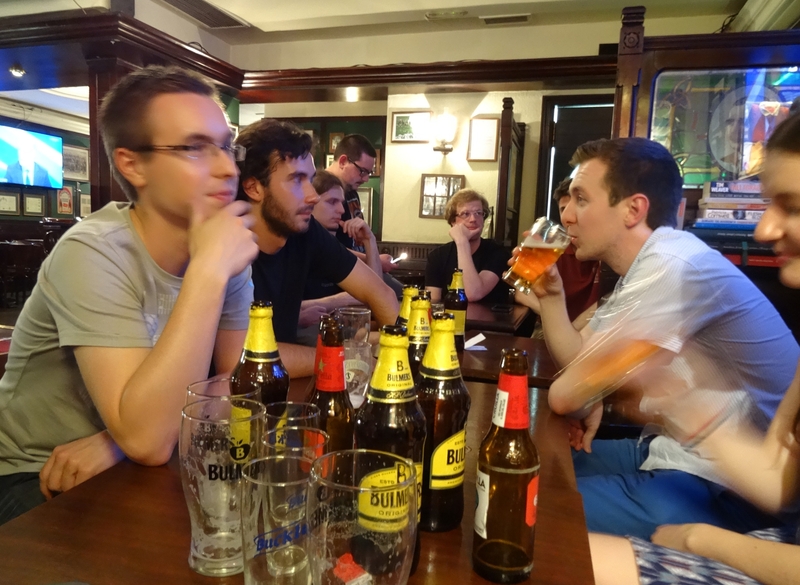 Many bottles of Estrella beer and Bulmer’s cider loosened our tongues and soon, there were many lively conversations going on. The participants from the British Isles even made some attempts to explain the broadcasted rugby game to us. I’m afraid they had little success though, which was only partially due to their accents (their English was actually the most difficult one to understand for many of us!). We still had a lot of fun and even got a bit more used to all the different accents. They would still cause a lot of confusion (and quite a number funny moments), though. 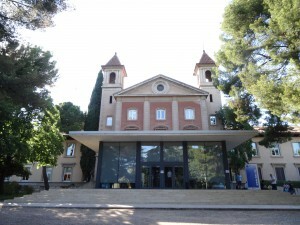 The actual training started on Tuesday with a visit to MareNostrum which is often dubbed “the most beautiful supercomputer in the world” – not really because of the actual computer, but because of it’s placement in the Torre Girona – and Mont Blanc prototype cluster which utilizes smart phone chips. We had the opportunity to enter the hall and watch it from a close distance while also getting a short introduction into history and technical details of the computers. A short movie also showed some research projects that used MareNostrum. While the pictures of MareNostrum definitely give a rough idea of how the place looks, they fail to capture the whole beauty. The ornaments on the walls, the stained glass windows, the quiet music playing, and the otherworldly quality definitely survived the desecration of the Torre Girona chapel. Next to the huge hall were the supercomputers are, there is a corridor with several old machines that were used at BSC. 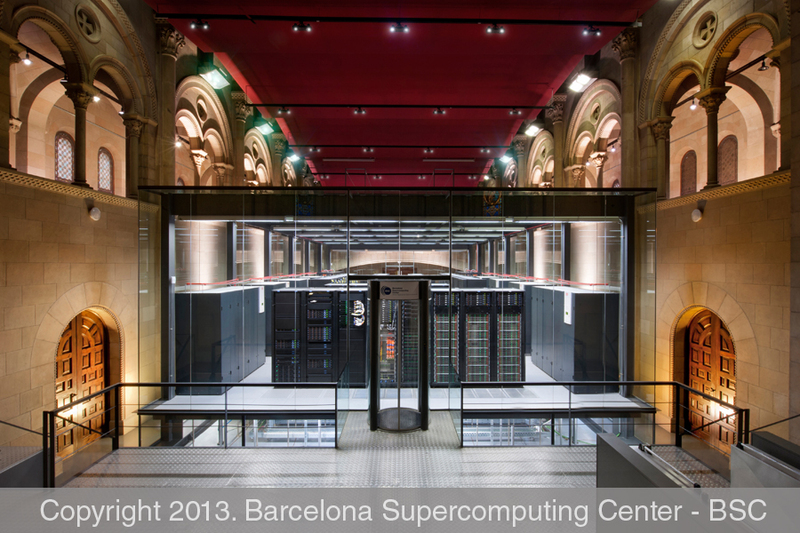 An impressive display of how fast HPC evolves. Did you know that a simple tablet computer today has roughly as much computing power as a state of the art supercomputer just twenty years ago? After this impressive display, we went back to the Sala Gran and dedicated the rest of the day to a more theoretical introduction to HPC. In just six hours, we learned about parallel architectures, performance parameters of parallel applications, compiling and running MPI applications, Paraver and Tareador – to name only a few keywords. It was definitely fast paced, but for a lot of us participants, it was just review. 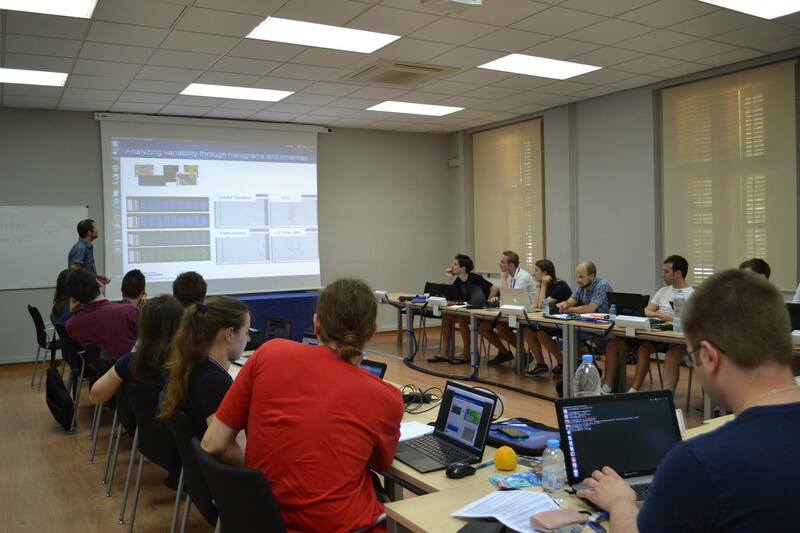 We all have different backgrounds after all – one of the main benefits of the training week was to ensure that everyone was at least familiar with the basics of HPC, the most common programming models, as well as, a few useful tools. I used the evening to get a little rest but those who still had energy, went out hiking to the top of one of Barcelona’s hills and enjoyed the view. 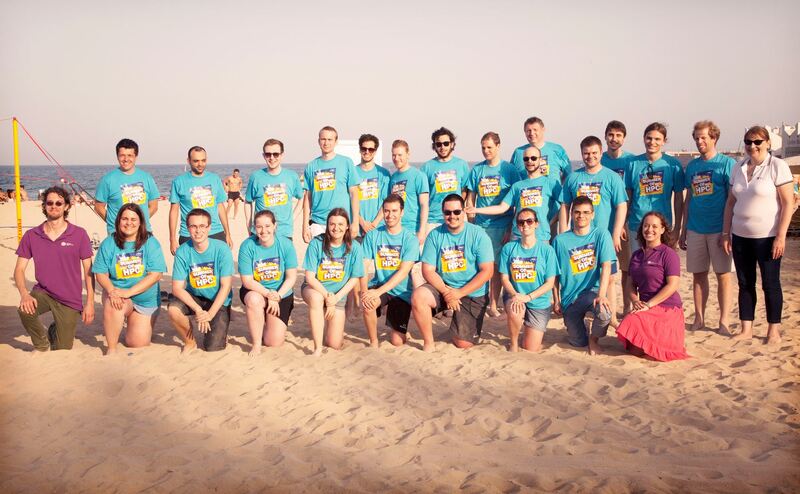 Wednesday: Lots of parallel programming and the beach! The morning of Wednesday was dedicated to MPI, a very common paradigm for programming distributed-memory systems that is based on the tasks explicitly exchanging messages with each other. This communication can be either point-to-point – exactly one task addressing one other task – or collective – one task addressing all other tasks or all tasks addressing one task. We learned about both variations as well as blocking and non-blocking communication. Afterwards, we moved on to OpenMP, a paradigm used for shared-memory systems. Contrary to MPI, it doesn’t need to exchange messages to share information between the threads – all threads operate on the same memory. They use synchronization mechanisms to coordinate access to critical code sections. The evening was reserved for a trip to the beach! Partly to fulfill our duties as HPC ambassadors and have a little photo session there which was organized by the BSC staff. Of course, it was also to have fun and enjoy the continuously sunny weather and the proximity to the beach! We took a lot of group pictures in our new Summer of HPC shirts – including our attempt at a smaller version of the famous Catalan human towers. Afterwards, we finally had an opportunity to enjoy the sea, sit in the sun, eat our sandwiches, and bury Anthony in the sand (he asked for it!). It turned into a really long evening – it was early morning when we returned to our hotel. By then, we had memorized each others’ names and most of the home countries. We even managed to understand Ben’s accent (at least most of the time)! But I think that it was this evening that turned us into a real group rather than just a bunch of young adults with similar interests. On Thursday, we deepened our knowledge about OpenMP and expanded it by using OmpSS. OmpSs integrates features of the programming models OpenMP and StarSs (which is developed by BSC) into one single programming model. That way, some of the limitations regarding OpenMP can be avoided. We also tried some hybrid MPI/OpenMP programming and a little GPU programming using CUDA. Of course, everything was supported by practicals as well! 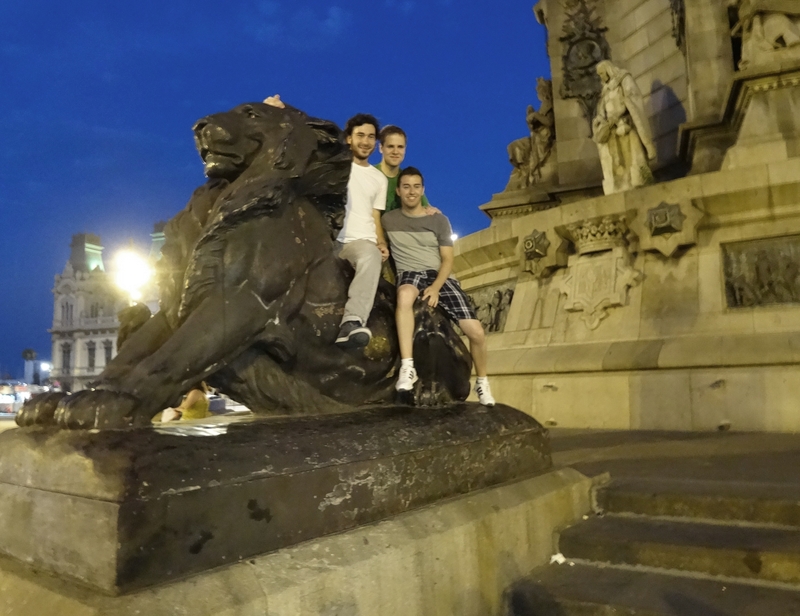 In the evening, a small group of us decided to visit some of the more touristic sites in Barcelona. It started off harmless. Meeting at the hotel, going to the next metro station, and going to the Plaça de Catalunya. 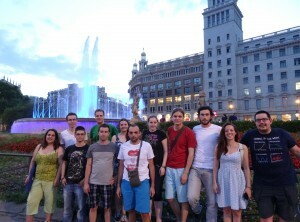 We stopped there to admire the fountains and take a group picture before strolling along La Rambla. Even in the evening, there was still a lot going on and lots of pushy people tried to sell us things. We managed to leave the street behind and wandered towards the port, stopping at the Columbus Monument for some more picture posing. The rest of the night included a lot of walking but actually not many events. Mostly, we were looking for a place to sit down and enjoy a drink. Actually, we found two places and we discovered quite a part of the touristic Barcelona in the process. Also, I learned to mistrust Anna’s judgement regarding distances – “It’s really close, just 10 minutes…20 minutes maximum.” turned into at least an hour of fast paced walking. Mostly uphill. At least we had lots of time to talk to each other (and, in my case, be annoyed at everyone who decided to walk back to the hotel instead of taking the night bus). The lectures on Friday were dedicated to visualization, which is not a HPC topic itself, but definitely relevant to every field of science that generates data! Especially so for HPC, which is often used for simulations and generates huge amounts of data that are difficult for human brains to process. Using visualization, the results become more accessible for humans and can be evaluated easier. After a short introduction to scientific visualization in general, we got to use VisIt, ParaView, and OpenFOAM ourselves, using already prepared data samples. Some exercises with OpenGL were also completed that day. Again, some of us already had experience with these tools while others were working with them for the first time, but I’m sure that everyone learned something new during the week although most probably valued meeting some like-minded young scientists from other countries even more! This became especially evident in the evening – our last evening together. Most of us would leave on Saturday, some very early in the morning, with no opportunity to meet again. We decided to celebrate our last evening by going out for dinner together. It definitely wasn’t easy to fit more than twenty people at a single table (as well as, getting everyone’s food preferences satisfied), but taking everything into consideration, it was a really nice farewell dinner. And, of course, a visit to a bar and some drinks had to follow! Despite Leon and Marijo (who had suggested the bar) suddenly disappearing, we had a lot of fun together, exchanged tips for our project site and promised each other that we would stay in contact, despite being in such different countries like Ireland and Cyprus for the summer. Many hugs were shared and many variations of “I can’t believe we have known each other for only five days!” uttered, but at some point, we had to leave and head back to our hotel rooms to get some rest for the journey to our project sites. For more pictures of our training week in Barcelona, have a look at my Facebook gallery.